After it was introduced in 2008, the personal vote option has become a success in the Iraqi democracy, contributing significantly to shaping election results in unpredictable ways, often against the wishes of the party leaderships. Firstly, it can be concluded that using the personal vote has become the norm in Iraqi elections. 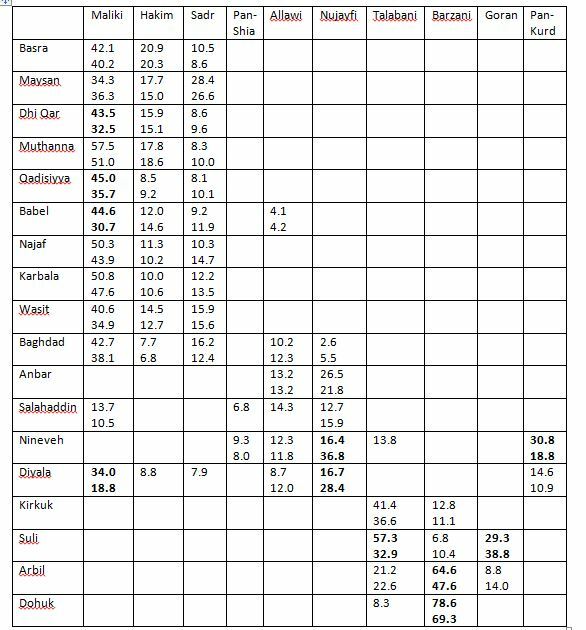 The numbers in the results clearly suggest a majority of Iraqi voters indicate a candidate preference in addition to party preference when they cast their votes. Just to take one example from the 30 April 2014 general election: Out of 27,800 Sadrist voters in rural Muthanna, more than 25,900 used the personal vote option, in line with high figures reported in previous elections. Iraqi voters use the personal vote despite the fact that technical modalities of voting still militate against its use: Voters must take the trouble of remembering the name of their preferred candidate since this is not indicated on the ballot papers. In analyzing data about the personal vote, it is also important to be alert to its many possible uses. These include pure stunts by a small number of senior politicians who feel so secure about their popularity that they deliberately place themselves far down the lists in order to demonstrate their ability to be promoted to the top by the popular vote. 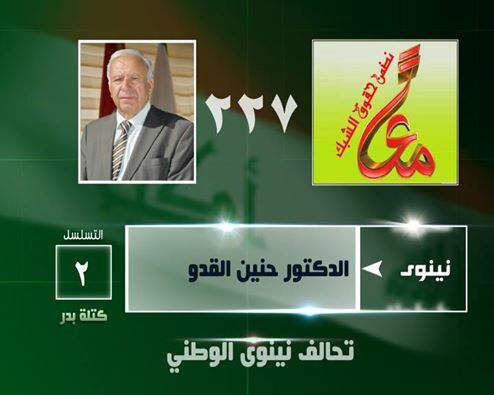 The most spectacular example in the recent general election is Hummam Hammudi of ISCI in Baghdad, who deliberately put himself at the rock bottom position of the list as candidate 138, only to be gracefully lifted to a seat-winning third position through the personal votes of some 10,000 devoted supporters. Mostly, though, the personal vote use affects the overall outcomes in ways that reflect real struggles between party leaderships and electorates as to which individuals are the best representatives to send to the Iraqi national assembly in Baghdad. A good way of getting an impression of the degree of internal fighting going on, already tested out with respect to the local elections last year, is to tabulate the data of some main lists according to their numbers of successful candidates initially placed on winning positions, followed by numbers of those promoted to winning seats from non-winning positions based on the wishes of the electorate (i.e. personal votes outnumbering those who initially held these lists positions), as well as the numbers of women promoted to winning positions because of the female quota (technically speaking “against” the preferences of the electorate, though it should be noted that more than 20 female Iraqi deputies this time won their seats without help from the quota thanks to strong personal votes). So that’s 27 new MPs from State of Law alone that hadn’t been planned by the party leadership which had placed them far down on the lists! After having played a role in the perhaps most spectacular use of the personal vote in 2010 (when they used it to promote candidates from their own party to top positions on the Iraq National Alliance slate), the Sadrists this time showed less interest in using the personal vote in radical ways to affect the ranking of candidates set by the party leaderships. On the other hand, the personal vote has been used with considerable impact among other lists, including the main Sunni and Kurdish ones. That’s just 3 blocs and yet we have no less than 44 deputies in the Iraqi parliament that probably wouldn’t have been there if the party elites had had it their way. The tabulations above don’t tell the whole story, though. 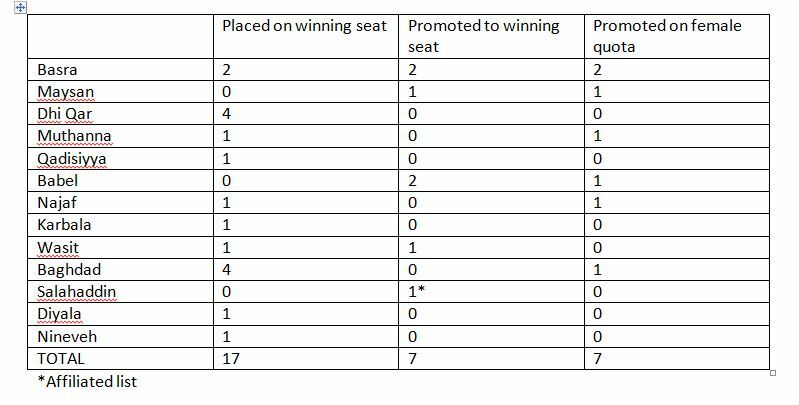 This is the case especially with respect to the distance travelled by some of the candidates far down on the list who went all the way to the top. This time, the phenomenon of big climbers was most pronounced in the big cities of Baghdad, Basra and Mosul, and with some particularly spectacular examples within Prime Minister Nuri al-Maliki’s State of Law alliance. They include 3 candidates in Basra who went from positions 29, 30 and 31 to become seat winners, and similar impressive climbs from positions 41, 45, 62, 69, 73 and 77 in Baghdad. 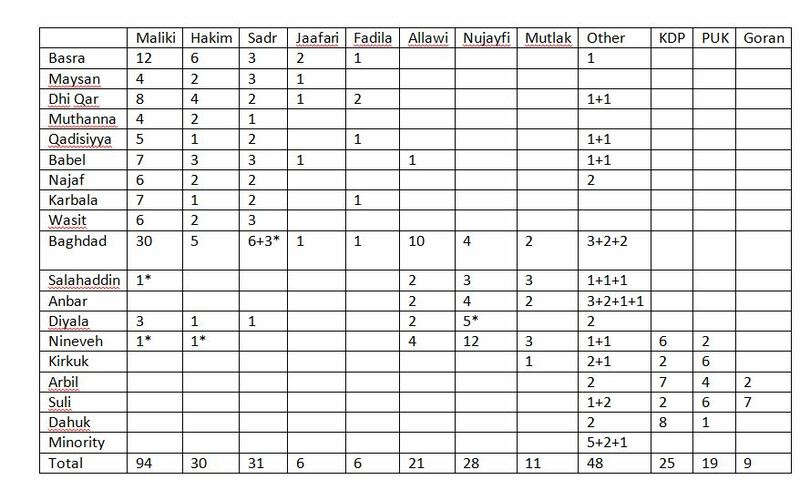 Also Muwatin had a candidate who went from 50 to 4 in Basra, whereas Nineveh winners for the Mutahhidun list of Usama al-Nujayfi included candidates 24, 29 and 53. All in all, it is the active use of the personal vote among State of Law voters that this time stands out in comparative perspective vis-à-vis previous elections. Incidentally, data about the personal votes may also be useful in evaluating the independence of IHEC. There has been some suggestions that the current commission, considered more friendly to Maliki than the previous one, may have been under pressure to manipulate the vote. But some of the painful exclusions of Maliki favourites following their personal inability to garner enough personal votes tell a different story. If IHEC was so corrupt as its critics claim, it would have been a comparatively easy job to shift internal votes to the advantage of party leadership favourites. Instead, we have seen several State of Law deputies lose their jobs due to poor electoral performance, including people like Ali Shallah, Hassan al-Sunayd, Khalid al-Attiya, Yasin Majid and Walid al-Hilli. Indeed, it can be argued that the personal vote establishes a second tier of accountability in the Iraqi elections since both candidates and voters will have more specific interests to guard and will be doubly aware to attempts to manipulate. This is important when the elections results are as disputed as they are in Iraq. Hopefully, after the expiry of the deadline for legal complaints against the results later this week the Iraqi elections commission can soon move forward to certification, thereby sealing some of these important expressions of nascent democracy even under adverse circumstances of regional tension.